And here we are, my first beer review of 2013. 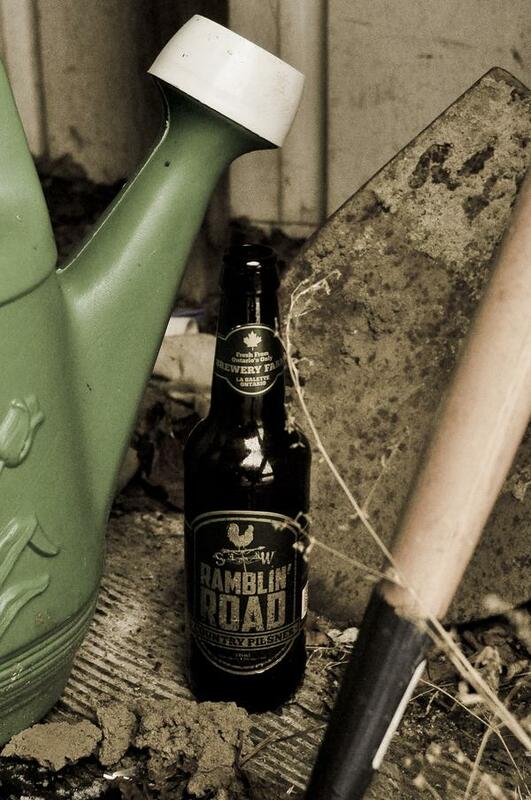 Since first hearing about them, I’ve been excited to try the offerings of Ramblin’ Road Brewery Farm out of Norfolk County. What caught my eye on them initially was that they are Ontario’s first and only “Brewery Farm”, which is to mean that they are a functioning farm and produce the ingredients going in to the small batches of beer they make. While they don’t grow their grains (yet), they do have a full hop garden and draw spring water from their own land. On top of that the brewery also does its best to be a part of the community by continuously promoting events and places taking place in “Ontario’s Garden”, Norfolk County. The three beers on offer by the brewery, led by Brewmaster/Farmer John Picard, are Country Pilsner, Country Lager and Country Ale. The reputation that the brewery farm has amassed from the festivals they’ve showcased their beers at has been hard to ignore, so it’s no wonder that I’ve been looking forward to trying one of their products. And once they finally finished bottling their beer the folks at Ramblin’ Road were incredibly nice enough to send me the Country Pilsner. Shall we take a look at it? I think we should. Colour – very clear bright yellow. Not too big a white head that eases down in to a thin layer. Aroma – Nice earthy scent of the grains hitting you along with a slight hop aroma quietly lurking in the shadows behind it. Taste – Now this…is interesting. Obvious earthy malt characters are coming up to the forefront, but the hops has disappeared from the shadows and is now walking with the malt as an equal. The bitterness of the hops is complimenting the earthiness of the grains very well… Though what makes this beer for me is the slight twist of sweetness at the end. Aftertaste is slightly bitter and warming. The grains are all that’s left. Verdict – A damn refreshing beer that celebrates the Pilsner style very well. The sweetness at the end is enough to make me want to try more and this is indeed something I would love to drink at the end of a tough day out in the garden. Next Post Welcome 680 News Listeners!